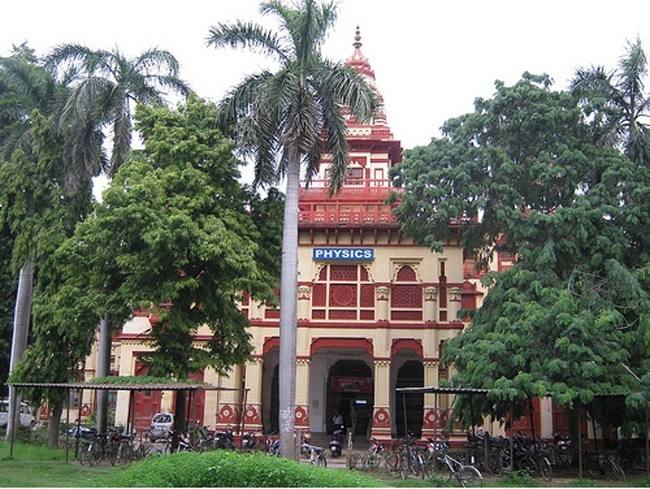 The Department of Physics has a glorious history of nine decades and was established as one of the earliest Department under the Faculty of science. The Department is recognized for many significant contributions to our understanding of experimental as well as theoretical physics. The main focus of the research activities of the theoretical and experimental group include: Nanoscience & nanotechnology, Hydrogen storage materials, DNA denaturation, Polymers and Protein folding, Liquid crystals and its spectroscopic study, Quark Gluon Plasma, Relativistic mean field theory for nuclear structure, Gauge theory, Field theory, Laser spectroscopy of glasses and other materials, Ultrasonic, Ion conducting polymeric electrolyte, Atomic & Molecular Physics, Sensors, IR and Raman Spectroscopy, Atmospheric Physics, Amorphous materials, Semiconducting and magnetic materials for Spintronics and swift Heavy ion radiation, Structure and spectra of biomolecules, Molecular Electronic Structure Theory, Molecular mechanism of Cancer, Optical Fiber etc. Department has entered into two International projects namely PHENIX at BNL (USA) and CBM at GSI (Germany) for the detection of Quark Gluon Plasma (QGP) and an Indian Collaboration INO for the detection of neutrinos. The Department of Physics is the nodal Department for the Centre of Hydrogen Energy, Nanoscience & Technology unit and the UGC Networking Centre. The Department offers Post Graduate teaching in Biophysics, Condensed Matter Physics, Electronics, Nuclear & Particle Physics, Space Physics and Spectroscopy and many elective papers. ISRO has recently provided some financial support to start a research and teaching programme in the field of Space Physics. 1898: Establishment of Central Hindu College by Dr. Annie Besant. 1916: CHC becomes constituent College of BHU- PG Teaching begins. ~1925: Research Activities Begin with Initial Research Programs in Cosmic Rays and Molecular Spectroscopy . Followed by Atmospheric Physics and X-ray Crystallography. Over the years many other research programs have been added in tune with the times with phasing out of older programs. The Department continues to address itself to the Frontier Areas of Research with concurrent upgradation of Teaching Programs as well. Objectives: Generation of knowledge in New Areas. Condensed Matter Experiment: Growth and Characterization of Materials (Nano-Materials, Superconducting, Hydrogen Storage, etc.) Amorphous, Quasicrystalline and Alloy Systems, Colossal Magneto Resistance, Multi Ferroic Materials and Diluted Magnetic Semicondutor (DMS), Nano Structures. Associated Faculty Members: Prof. O. N. Srivastava, Prof. R. S. Tiwari, Prof. A. K. Ghosh, Dr. A. Srivastava, Dr. K. Singh, Dr. M. A. Shaz, Dr. N. Mehta. Associated Faculty Members: Prof. Yashwant Singh, Prof. Jokhan Ram, Prof. Shri Singh, Prof. Sanjay Kumar, Prof. Debanand Sa . Atomic and Molecular Physics: Electronic Spectra and Structure of Molecules/Biomolecules, Spectroscopic studies of Metallic Glasses,Laser Spectroscopic Studies of Novel Materials and Dark States, Vibrational Dephasing and Phase Transitions, Electron-Atom/Molecule Collision Light Scattering from Soft Matter and Bioparticles . Associated Faculty Members: Prof. P.C. Mishra, Prof. S.B. Rai, Prof. R.Shanker, Prof. R.A. Yadav, Prof. Ranjan Kumar Singh, Dr. A. Bahadur. Whistlers, Earthquake Precursors Analysis,VLF Waves,Aerosol Studies and Detector Development for Space Physics. Associated Faculty Members: Prof. A. K. Singh, Prof. B. K. Singh. BRST Symmetrics, Relativistic Heavy Ion Collisions (PHENIX/CBM Program), Physics of Quark-Gluon Plasma, Experimental Nuclear Physics, Neutrino Physics, Quantum Field Theory, String Theory, Particle detectors and Instrumentation:.